When I became Editor of Design and Technology Education: an international Journal (DATE:IJ) in 2005 there was a clear direction ahead. It had been set many years previously by the late Professor John Eggleston at the first IDATER conference in 1988. It was actually DATER then (Design and Technology Education Research and Curriculum Development Conference), and it was not until 1992 that it became International. It did so quite naturally as international delegates were welcomed to the Department of Design and Technology at Loughborough University by John Smith … IDATER’s founding Director. This is what John Eggleston said. (The proceedings were published the following year by Longman). Of course one of the key reasons for the establishment of IDATER had been the looming challenges of the new National Curriculum. It was felt to be necessary to establish research foundations and an infrastructure to support the emergence of Design and Technology, and this was a task to which all would lend a hand. As a Lecturer at Loughborough I was privileged to attend all the IDATER conferences and eventually to become Co-Director with Professor Phil Roberts following John Smith’s decision to prioritize other roles. I have always supported John Eggleston’s view. Research is the responsibility of the whole Design and Technology community. It is a crucial element in supporting D&T’s vitality and strength, and is neglected at our peril. IDATER was still strong in 2001 when the decision was taken to transform it into the research wing of the Design and Technology Association’s Education and International Research conference. This decision was taken because in 1988, and in all the early years, the delegates came from all parts of the D&T community (schools, higher education, local authorities, HMI, examination boards, industry, charities, consultants etc) but by 2001 they were nearly all from higher education. So, if important research was published, how could it have an impact in schools where it mattered? The teacher trainers were there, but not the LEA Advisors who could have disseminated important matters in IDATER’s early years, so the move to bring the research conference closer to teachers had to be made, whatever the outcome in my view. The 2005 Conference at Sheffield Hallam University was probably the zenith for this strategy, and the final conference was held in 2010. I was approached to become Editor of the Design and Technology Association’s research journal in 2005 when Professor Richard Kimbell wanted to move on. Again it has been a privilege to serve in this role. In recent years, the same issue that dogged the conferences of the disconnect between research and practice has been rumbling under the surface. DATE:IJ had to become open access. What would be the point of publishing research within this tradition, however good the research, if those with the potential to significantly impact on classroom practice could not access it? Again, and of course, the teacher trainers would still be able to access research that was published in ‘subscription journals’ and their influences would filter through as their trainees entered the profession, but this is hardly enough. Then ‘Impact Factors’ appeared to muddy the waters further. Impact Factors are awarded on the basis of evidence generated by Thomson ISI (Institute for Scientific Information) and consequently an application was made to Thompson ISI several years ago. The journal was not awarded an Impact Factor because its citations were assessed as being too low. It is not my intention to quibble over the decisions made by Thompson ISI, but, together with the reality that university managers often use Impact Factors, as a simple management tool through which to guide their staff, some important research is inevitably published elsewhere, and, in particular, in subscription-based journals where it will not be read by teachers. If the relationship between research and practice in Design and Technology education is the desired ‘impact’ of highest priority, rather than citations in academic journals, then this must also be addressed. How are the barriers introduced by the use of Impact Factors as policy instruments within universities to be overcome? For one bright spot on the horizon we must be grateful to Google Scholar who have just started their version of ‘Metrics’ as shown below. Google Scholar is again measuring citations, but at least the system is inclusive rather than exclusive. And now D&T teacher training in universities is being undermined. If I actually thought it was deliberate, you could see a grim determination in recent policy measures to ensure that research and practice never come into contact. I guess this is all meant to be sorted out by the Teaching Schools, but I suspect they might have other priorities. As the plans for REF 2020 are being made, it would appear that priority is now being given to open access publication, and presumably so that those on whose behalf the research is conducted and might be able to make use of it, can actually read it without paying to find out if it is important to them. It seems enough to expect in my view that people who might use the research take the trouble to find out about it without expecting them to pay to have this opportunity. Hopefully, this new REF policy will benefit DATE:IJ, but I think it’s important to note that this is not why it is open access! Anyway, after 11 years as Editor it is time for me to move to other tasks as well. There is no particular crisis for DATE:IJ. The next three Issues are planned and will be excellent and there is a ‘small stream’ of quality research submissions with many coming from Scandinavia. However, who in England (apart from the teacher training survivors in HE) is now conducting research in D&T? And who is reading about the research that has been completed? It has to be time for some serious discussions and meetings of minds, or where will the tradition that John Eggleston started and many have supported go next? Currently, we seem to be standing at the fork in the road where research and practice are carried further apart. It’s time for some major restructuring (as well as a new Editor). At LDP we have already published Design Education: a Vision for the Future which address some of these matters, but it’s beginning to feel like time for a sequel. LDP’s recommended supplier is The Great British Bookshop:Great British Bookshop The book is also available from good book stores (eg Waterstones) and online book sellers (eg BOOKS etc). You are welcome to download a section of the book by clicking on the link below. This is a free download. 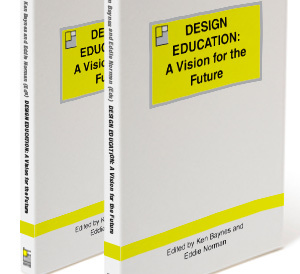 View the Book Page for Design Education: A Vision for the Future.